Monitoring – WWT » Tallycounters at the ready! With the recent mass arrival of geese to our shores, it’s a timely reminder that the first Icelandic-breeding Goose Census (IGC) coordinated count of the 2015/16 season is just round the corner. 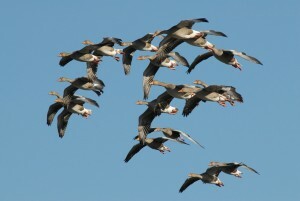 With the help of a network of volunteer counters, the IGC aims to determine the population size of the Iceland Greylag Goose and the Greenland/Iceland Pink-footed Goose, as well as providing information on their distribution during the autumn and early winter. The first coordinated count will take place on the weekend of 17/18 October, with the November count due to take place on 14/15th. Sites supporting Pink-footed Geese should be covered during both months, whilst those holding Iceland Greylag Geese should be counted in November. Counters are reminded that they can now submit their records online using WWT’s new Waterbird Monitoring Online site. Here, users can enter data as well as view records they have contributed to the census. If you need any assistance using the site, please Contact us. As IGC counters start gearing up for another winter’s worth of counting, results from the 2014/15 census have recently been published on our species account pages and in GooseNews, the GSMP annual newsletter. Results show that the population estimate for the Pink-footed Goose (393,170) was 5.7% higher than recorded during the previous year (372,074) and the highest recorded to date. A count of 78,970 Pinkfeet made at Montrose Basin, Angus, was the highest IGC count ever recorded at a single site and accounted for one fifth of the population. The 2014 population estimate for the Iceland Greylag Goose (89,668) was only slightly higher than in 2013 (88,577), with Orkney continuing to hold the bulk of the population; an estimated 45,881 birds were thought to be present on the islands during the census. Good luck and thanks to all those counting. We hope you have goose-filled weekends!